Kaiser Maximilian Espresso Bar features the new and old world cuisine (old for Europe, new for America) and you can enjoy it for breakfast, lunch, dinner or dessert and coffee. The menu items are light, rich, sophisticated and have super creative recipes. The chefs continue to update all the traditional, continental favorites and look for new dishes every year. 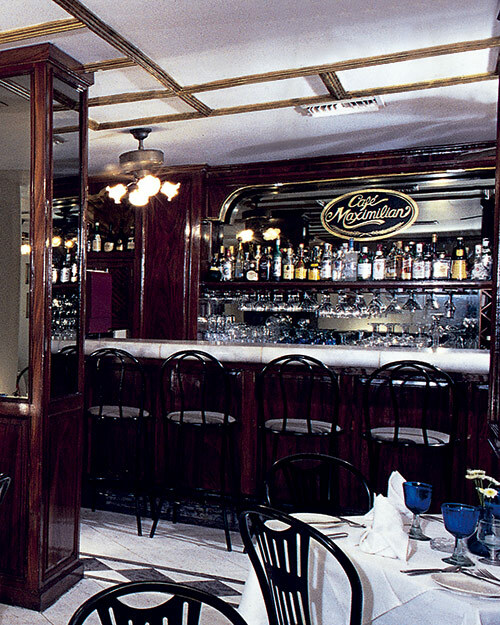 Everything is served with the flair of a typical Vienna coffee house by friendly waiters. The atmosphere at the Espresso Bar lets people enjoy life at a leisurely pace no matter what time of day you care to join them. Sip one of the many coffee offerings. There is also a full bar and extensive wine list. Breakfast is served from 8am until 2pm. They prepare all your morning favorites plus some specialities of the house. Benedictine Maximilian is an English muffin topped with salmon, poached eggs and a wonderful tarragon sauce. It's a breakfast fit for a King or a Kaiser, the Kaiserschmarrn is an Austrian hotcake, cut into small pieces and topped with a fresh berry sauce and raisins. What a great way to start the day. The lunch menu, features gourmet sandwiches, fresh salads, soups, pastas, and even hamburgers (Austrian style, more like a meatloaf)from noon until 11pm. This lighter fare includes a classic rueben sandwich, Niçoise salad and more. The main dining room's complete dinner menu is also served from noon until 11pm. Kaiser Maximilian is famous for its elegant, homemade desserts. Savor a Linzertorte made with almonds, lemon roll, Rehrücken, a flourless dark chocolate cake, apple strudel and more. If you are looking for something a little cooler, try one of the ice cream sundaes. There's the Maximilian Cup with pecan and vanilla ice cream topped with bananas and Kahlúa cream or the Emperor Cup with chocolate ice cream topped with fresh pineapple, fresh coconut, strawberry sauce and cream. Both the main dining room and the Espresso Bar have sidewalk tables, air-conditioned rooms inside, a superior wait staff, and casual elegance. Get to know Kaiser Maximilian any time of day. The Espresso Bar is located on the corner of Olas Altas and Manuel Dieguez in Zona Romantica next to Hotel Los Arcos.